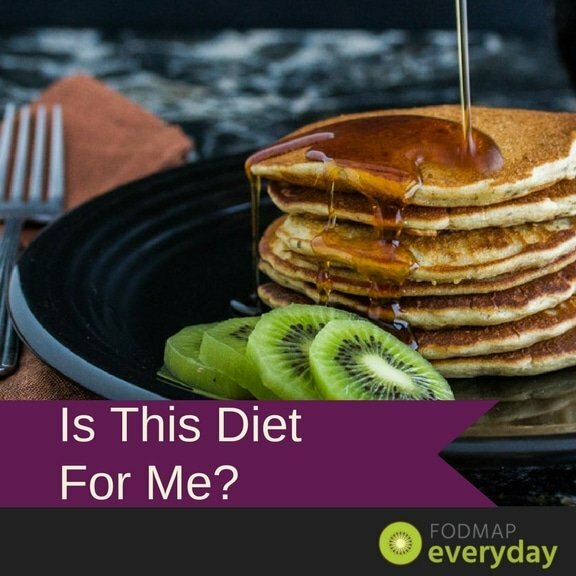 Is The Low FODMAP Diet for Me? Let’s find out! 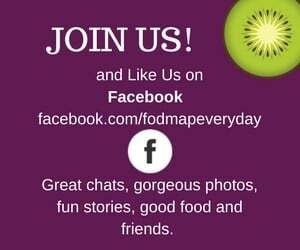 If you have come into our FODMAP Everyday® community this far you were probably motivated by the suffering that you or a loved one has experienced or you have heard about the Low FODMAP diet and want to know more. You have been suffering with IBS pain and debilitating symptoms and are tired of feeling that way! You want your life back. You’ve tried diets and supplements and maybe even meditation and medication, but you have not achieved the amount of relief that you seek. Often times you are even scared to eat because it seems like your symptoms emerge so randomly that you never know when they will hit. For many people they get to the point where they think there is no answer and that they just have to live this way. YOU DON’T! You can live pain-free with your IBS and we are here to help you. Do you experience digestive symptoms such as abdominal pain, diarrhea and/or constipation, excess gas and/or bloating? Have you been tested for celiac disease and has it been ruled out? Has a gastroenterologist diagnosed you with irritable bowel syndrome (IBS)? Has your doctor diagnosed you with irritable bowel disease (IBD), small intestinal bacterial overgrowth (SIBO), gastroesophageal reflux disease (GERD) and/or non-celiac gluten sensitivity (NCGS)? After evaluation has your doctor suggested looking into a low FODMAP diet? 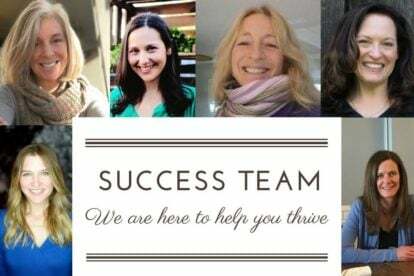 Have you tried dairy-free and gluten-free diets and experienced seemingly positive yet random results? 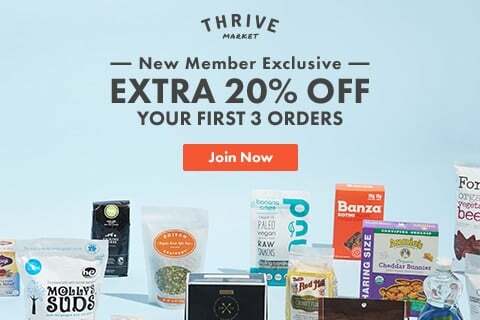 Are you ready to try a whole new way of eating that just might provide you with complete symptomatic relief? Okay, if you said yes to most (or all) of those questions, read on. Let’s take it step by step. 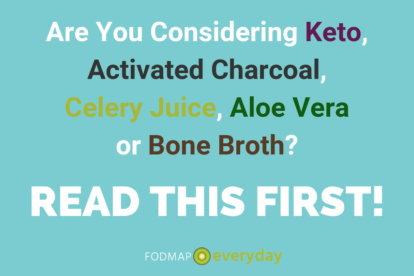 If your body is reacting to FODMAPs then any of these symptoms, or a combination of them, are very likely part of your everyday experience, but they do not have to be. By following a low FODMAP diet most, and possibly all, of your symptoms might be relieved. But first, it is recommended that you work with your doctor or dietitian. It is estimated that 2.5 million people in the U.S. are still undiagnosed with celiac disease. 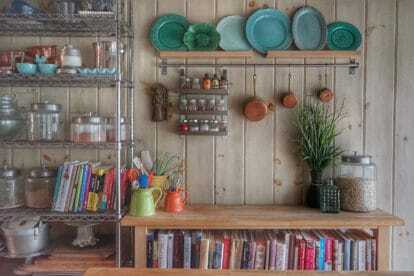 When someone with celiac disease eats gluten – a protein found in foods such as wheat, rye and barley – their body mounts an immune response that attacks the small intestine. These attacks lead to damage to the villi, the small fingerlike projections that line the small intestine. In turn, nutrients will not be absorbed properly, which leads to life threatening symptoms. The only current treatment for celiac disease is a strict, gluten-free diet. It is vital to work with your medical professionals. Most likely your general practitioner (GP) will not be well versed with the low FODMAP diet. We highly suggest working with a gastroenterologist or registered dietitian who is; not all are, although that is changing as the FODMAP diet becomes more mainstream. Best-case scenario is that your doctor isn’t satisfied with telling patients that they “have IBS”. As Dédé’s gastroenterologist, Dr. Tassoni, explained that just means your gut isn’t happy and we need to find out WHY! Up to 75% of patients with IBS respond favorably to a low FODMAP diet. Maybe you will too! Has your doctor diagnosed you with inflammatory bowel disease (IBD), celiac disease, small intestinal bacterial overgrowth (SIBO), gastroesophageal reflux disease (GERD) and/or non-celiac gluten sensitivity (NSGS)? Now it gets a little trickier. At this time it is not believed that a low FODMAP diet can induce or maintain remission in patients with Crohn’s disease or ulcerative colitis, however, and this is a big BUT, a low FODMAP diet might be able to help manage symptoms and provide a better quality of life. And that’s what we at FODMAP Everyday are all about! As far as celiac disease is concerned, it is estimated that about 20% to 25% of those diagnosed with celiac disease and who are following a gluten-free diet still experience debilitating symptoms. This could mean that there is concurrent IBS, which might be addressed by the low FODMAP diet. The diagnosis and treatment of SIBO is an evolving science. In brief, if there is an overgrowth of bacteria in the small intestinal, IBS-like symptoms can result. Antibiotic treatment is currently typically recommended but a low FODMAP diet might prohibit a relapse after the course of medication. Right now the evidence is mostly anecdotal. Consult with your doctor and/or registered dietitian to see if a low FODMAP diet might be worth trying. If it is, then we are here at FODMAP Everyday to help you. GERD is widespread. Not everyone who has GERD has IBS but many of those with IBS also have GERD. There isn’t conclusive evidence why a low FODMAP diet might help GERD symptoms but many of those with GERD who have tried a low FODMAP diet have reported fewer symptoms. It might be that smaller portions of food or generally healthier food choices reduce acid reflux or maybe because there is less bloating there is also less upward pressure on the diaphragm. In any event, the low FODMAP diet might be worth discussing with your doctor as a possible approach to symptomatic relief. NCGS, which stands for non-celiac gluten sensitivity, is an acronym that you might not have heard of. 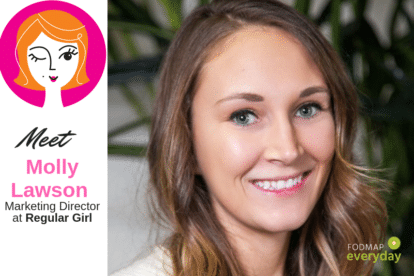 For years Dédé reacted badly to gluten even though she wasn’t diagnosed with celiac disease. Many people (not medical professionals) even told her that if she wasn’t celiac then her condition wasn’t “real”. Sound familiar? While there is no biomarker for testing for NCGS, it appears to be a widespread issue. Some researchers believe that the FODMAPs in certain grains might be the key to symptoms as opposed to the actual gluten itself being the culprit. This is why the low FODMAP diet isn’t gluten-free per se. Another way of understanding this is that ingesting wheat might affect you, and maybe you always thought it was the gluten in the wheat, but there is a possibility that it is because of the FODMAPs (specifically the fructans) in the grains. Again, for any of these conditions, working with your doctor and/or registered dietitian is key. 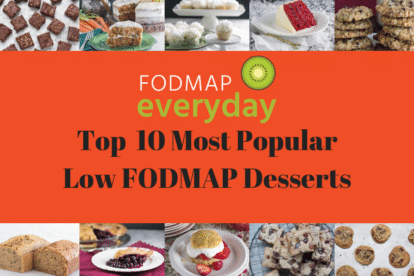 After evaluation has your doctor suggested trying a low FODMAP diet? 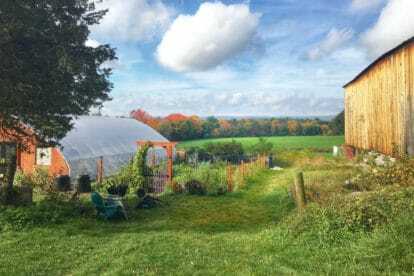 For years Dédé tried medication and various diets (raw, vegetarian, vegan, GF, Paleo, etc.) and none of them offered reliable relief. It took a hospital stay and extreme pain to get her to say ENOUGH! She was ready to try anything. 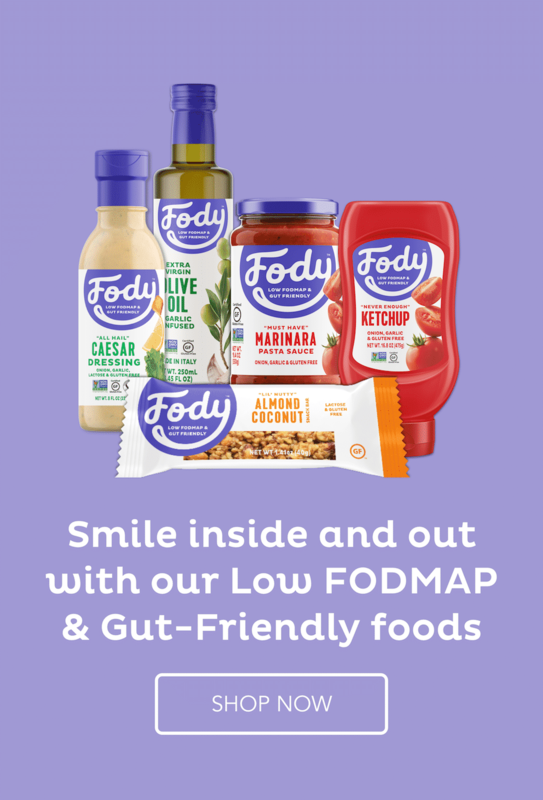 When you first look at the low FODMAP elimination diet it appears to be horribly restrictive and you might be discouraged. But that’s what we are here for! To show you how you CAN do this! 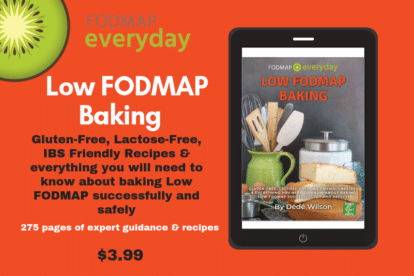 Read The Low FODMAP Diet as your first step to living pain-free and eating delicious whole foods that your whole family will enjoy. FODMAP Everyday is here to not only help you get by, but to THRIVE!